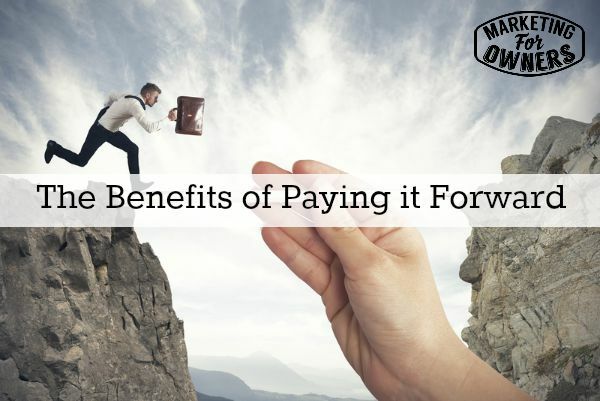 Today we are going to talk about paying it forward. Now, this comes as suggestion of something that I discussed with Clare, the lovely Clare of eBizWisdom.com. Now, for those who looking up eBizWisdom that’s eBizWisdom.com and finding it says, website coming soon. That’s because Clare’s been on line for a long time and her consultancy business is just taking off. But, what Clare explained to me, which is true and this works for everyone, is that as business owners, we need to be ‘paying it forward’. Now, what ‘paying it forward’ means is doing things for others without expecting anything in return. Nothing, nada, zip, nothing! I know how difficult that is. When you do something you think, “nothing? Nothing in return?” But, it works! And the more of us that do this, the more the world will be a lovely place. But, what Clare explains is, she is a member of a group- kind of like the community of owner’s at the Owner’s Club here at Marketing for Owners. And she learns a lot from that group. In fact, she pays to be a member. But, others ask questions on forums and things. And because she’s been using the products for a while, Clare’s gained a certain amount of expertise, and she helps others. She helps others by answering their questions and helping them out with their own queries. She is not been paid; she is not being asked; she just does it, because she is… lovely- lovely Clare. By the way, Clare makes, and edits and writes videos in the perpetual sales cycle course. That’s Clare.. Yes, she sounds… She is as lovely as she sounds. Now what that does overtime, is that people see that she is obviously an expert. It gives her a position of authority. But eventually people will ask her directly for help, because by putting herself out there, by showing her expertise, by paying it forward it comes back in spades. And it has done amazing wonders for Clare! She’s picked up consultancy jobs from people she wouldn’t imagine would even know who she is. And, they’ve actually hunted her down specifically. They’ve not necessarily spoken to her. They’ve seen how she has helped others. They’ve hunted it out and they’ve asked her if she would be able to do work for them. Work that she hasn’t even thought of charging for in the past! Isn’t that clever? Now, think of that how that can work for you. In any industry, there’s generally a forum; there’s generally an online community somewhere. Why not dive in and be a resource to others? Help, but don’t expect anything. Don’t ask for anything. Don’t give them a “well I can help if you want to get in touch and discuss prices”. Just help them. What that does is it gives you free platform- someone else’s platform, someone else’s audience to demonstrate what you can do! And by being abundant and utterly amazing, Clare’s words, it comes back. It’s Monday and as you know we have a book for the week. And although, I always explain to you that my entire system- the ‘perpetual sales cycle’ is designed to not need any sales people whatsoever because people will come to you and ask for the product and give you the money. You’ve done it with all the other work around it. You don’t have to do any selling. I don’t employ a single sales person. We got over a hundred thousand customers well over and continuously growing. But, today’s book is going to be a sales one because, of course, some people still need sales. 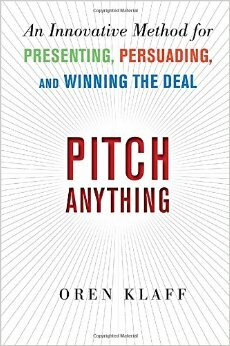 So, if you’re going to do sales, I recommend- Pitch Anything by Oren Klaff. Now Oren is an experienced finance guy. He earns money from that. It’s a sales job. He can sell anything. I read the book. I actually read it a long time ago and in one business we adopted some of the principles although we weren’t selling. We still adopted some of the principles. One of the main ones about it is that, you are the price. You’re not trying to sell something. You’re trying to be the price! Make them want you… And it turns, most selling concepts on the head. But it’s very, very helpful. It’s an eye opener. It’s and easy read, so don’t worry. But I’m just going to read out some points I’ve got written here. Somebody said, ‘move over Neil Strauss and and game theory. Pitch Anything reveals the next big thing in social dynamics, game for business’. But what he does is, he has an acronym of ‘strong’ which is: ‘setting the frame; telling the story; revealing the intrigue; offering the price; nailing the hook point; getting a decision. 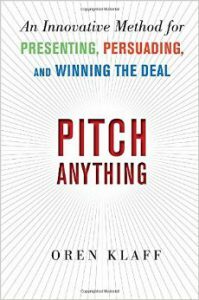 So, that’s, ‘Pitch Anything’ by Oren Klaff. How can you pay it forward this week?